In the heart of Chattahoochee-Oconee National Forest there is Helton Creek Falls. Dancing Creek Cabin is located at Helton Creek with a nice and easy hiking opportunity to 2 waterfalls; a mile from Vogel State Park Lake Trahlyta and fishing rivers and about 2 miles from the most famous Appalachian Trails. DANCING CREEK is in an elevation of 2,500’ and offers you and your family 6 acres of forest land to explore. Seclusion and privacy of the enchanted mountains and creek is shared with Whispering Forest Cabin, perfect combination for large family gatherings, bikers and hikers or just to immerse in nature with the most needed quiet of wildlife. DANCING CREEK has comfortable country accommodations for 8 guests, King Suite in the main floor with tub/shower combo; Queen size bedroom and loft with 2 Full size beds. Kitchen is equipped with all you need for the family cooking. Flat screen TV set and Wi-Fi if you really need to be connected with the world. Don’t forget how much your 4-legged friend is going to enjoy the family vacation. Fire pit next to the creek for those relaxing evenings; large porch for the outdoors meal, morning coffee or BBQ in the grill. 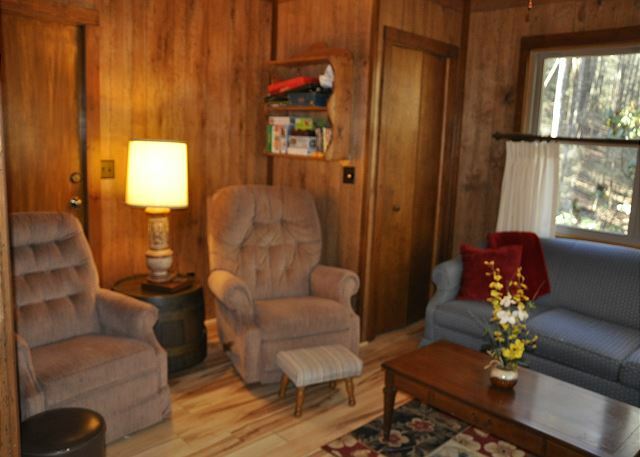 If you prefer the warmth inside the cabin, there is a gas stone fireplace as a center point in the leaving area. Nice older cabin. Water heater has bad lower element (you’ll run out of hot water if you don’t budget correctly). Freezer section is fine, but Refrigerator won’t cool food - some of ours spoiled. Gas log operation intermediate (I think the safety thermocouple needs to be adjusted). We are thankful for your comments and appreciate your stay with us. We immediately check the situation you describe for the fridge and is in good working condition; the gas log fireplace has a safety feature, when the area gets too hot it shutdown automatically to prevent an accident. We will be waiting for your next vacation with us. We loved this cabin! It was a lot better than the pictures. Clean and well maintained. Plenty of space. Would definitely recommend this cabin! Fantastic! We loved having you with us too. Hope to see you back very soon and please call us directly to apply your Frequent Guest Discounts on your next reservation. Much thanks. I have to say for a last minute weekend purchase it was nice experience. Dealing with the management company get the directions and passcode though was a nightmare. Make sure you have at least a couple days for those folks to respond. Fax,Email, and numerous phone calls, that for 3 mins refer you sending them an email. The outdoor deck just above the creek was perfect and you can easily relax with a nice glass of wine. The owners happened to be in the cabin when we arrived and were trying to resolve an issue with the tv and also followed up the next day to make sure we didnt have issues. Theres a descent hike that we learned about from talking with them. The only concerns while we were there was the smaller kitchen. Theres an electric range that slopes backwards and that of course causes challenges when trying to cook in a pan. The utensils are what youd see from the dollar store and the cooking knives would not cut a pack of bacon open. The island felt like it was going to fall over if you bumped it. Last but not least the 35yo fridge needs to be replaced. It would not keep food cold unless you were trying to freeze it and a good size cooler is a must. I get it its a rental cabin but storing raw meat at the appropriate temp is necessary. Thank you for sharing your comments. It is imperative for all guests to promptly send the signed Rental Agreement, this is your responsibility, sorry, no body will escape this step of high importance, even if you are familiar with the area when you were a kid and played in the neighborhood; everybody has to sign and commit to follow our guidelines; once you responsibly send the asked paper automatically you receive directions and security codes. Thanks again for your cooperation.